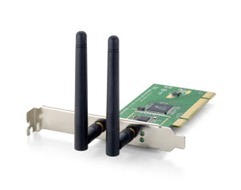 The LevelOne N_Max Wireless PCI Card brings the fastest wireless speeds to your computer. Using the latest 802.11n technology, you enjoy top performance for gaming, multi-media streaming, digital home surveillance and VoIP. Easy to install and configure with the included software and Windows Utility.